Ganjala Pass trekking lies in an upper Langtang valley combine with Helamabu region, center north part of Nepal. Ganjala pass is one of the famous high passes in Nepal which proposes with physical fitness and well equipment for few meters technological climb. Three nights will be sleeping in Tent house with full board organizes. The excellence view, experience the varieties of ethnicity, wildlife, flora and fauna is the highlights of Ganjala pass trekking for adventure seeker. Trekking to upper Langtang Ganjala Pass provides the perfect environments of rivers, forests and high soaring peaks. Witnessing the Tamangs attired in traditional Tibetan gowns adds to the rich cultural experience. Ganjala pass trek is a great choice for nature lovers and adventurers alike. Langtang Ganja la pass trekking is challenging trekking trail in the Langtang Himalaya area. Lantang Ganja-la pass 5100 meters trekking offers panoramic Himalayan views, lush valley and beautiful Helambu Valley. Ganjala trek begins from Shyabru Besi passing through Langtang village, trekking trail are heading to Naya Kanga Base camp. There is not a proper Tea house for a few days, so organizes camping until to Tarky-Chang. You will finish trek in Melamche Pul Bazaar than a few hours drive to Kathmandu. As we all know a powerful earthquake 7.8 magnitude shook Nepal on the 25th of April 2015 causing many human casualties and destroying Langtang and Helambu areas. So that we heartily request to visit on that area, when you buy the foods and accommodation the local victim people can take a benefit from you that means indirectly you help for earthquake victim peoples. Day 01: Kathmandu to Syabru Besi (1430m), Overnight Lodge/Camp. Day 02: Syabru Besi to Lama Hotel (2380m), Overnight Lodge/Camp. Day 03: Trek from Lama Hotel to Langtang (3500m), Overnight Lodge/Camp. Day 04: Trek from Langtang to Kyangjin Gompa (3800m), Overnight Lodge/Camp. 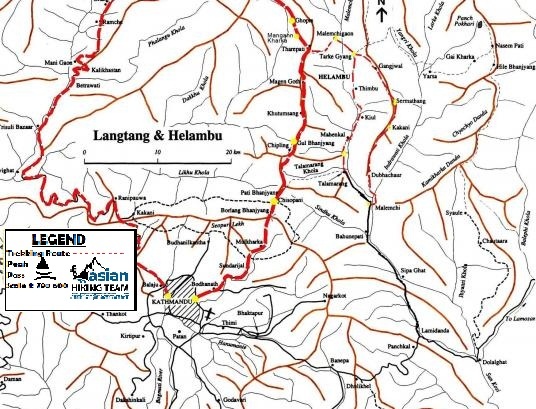 Day 05: Today is the rest day so we can explore upper langtang valley. Day 06: Trek from Kyanjing Gompa to Ngeganga Base camp (4000m), Overnight Camp. Day 07: Trek from Ngeganga to Keldang (5106m) via Ganja La (5100m), Overnight Camp. Day 08: Trek from Keldang to Dukpu (4080m), Overnight Camp. Day 09: Trek from Dukpu to Tarkeghyang (2740m), Overnight Lodge/Camp. Day 10: Trek from Tarkeghyang to Shermathang (2621m), Overnight Lodge/Camp. Day 11: Trek from Shermathang to Melamchi Pul Bazaar (846m), Overnight Lodge/Camp. Day 12: Melamchi Pul Bazaar to Kathmandu, overnight Hotel. Tented Camping for few nights. All camping equipment, foods and necessry porters, cook, kitchen boy. Day 05: Today is rest day explore upper Langtang valley (B/L/D. Today is acclimatization rest day so can climb Tserko Ri, trek along a steeply ascending trail all the way to the top. On the way you can see Himalayan pheasants, Himalayan deer and outstanding views of surrounding peaks and mountains. From Tserko Ri, you have panoramic views of Sisapangma, Langshisa Ri, NayaKang, Yala peak, Langtang Lirung and many others. Stay overnight at lodge/Camp. Day 06: Trek from Kyanjing Gompa to Ngegang Base Camp(4000m), Overnight Lodge/Camp (B/L/D. Takes about five hours. The trail goes on ascending and the area is covered with little natural vegetation. Since there are not any available lodges, you need to camp. Stay overnight in camp. Day 07: Trek from Ngegang to Keldang (5106m) (B/L/D. Ganja La (5100m.) takes about five and half hours. This day is comparatively strenuous as you need to cross the Ganja la pass. You find the Ganja la pass covered with snowy ice most times throughout the year. Stay overnight in camp. Day 08: Trek from Keldang to Dukpu (4080m), Overnight Camp (B/L/D. Takes about five and half hours. Your camping site will be inside the forest. This day will be a long day walking along ridges and grassland with amazing views of the mountains. Stay overnight in camp. Day 09: Trek from Dukpu to Tarkeghyang (2740m), Overnight Lodge/Camp (B/L/D. Takes approximately five hours. The trail descends about 200m. and then climbs the 4100m pass. Views from the pass are spectacular to the Annapurna and Everest Regions. From the pass, the trail descends through pine and rhododendron forests past a tiny herder's settlement to Tarkeghyang. You can also visit one of the oldest Buddhist monasteries and Sherpa villages. These villages are well settled and are inhabited by friendly and cheerful natures people. Stay overnight in camp/Lodge. Day 10: Trek from Tarkeghyang to Shermathang (2621m), Overnight Lodge/Camp (B/L/D. Takes about four hours. There is a beautiful village about half way to Shermathang. Shermathang is another pretty Sherpa village where you can visit several ancient monasteries. From here you can see the Jugal Himal. Stay overnight at lodge/camp. Day 11: Trek from Shermathang to Melamchi Pul Bazaar (846m), Overnight Lodge/Camp (B/L/D. Takes about four hours. The trail gradually descends all the way to Melamchi Pul Bazaar through meadows and cultivated fields. On the way, you come across several old villages with their own particular traditions. Overnight in lodge/camp. Day 12: Drive to Kathmandu,overnight hotel (B/L). After breakfast we drive from Melamchi Pul Bazaar to Kathmandu takes about four and half hours. Stay overnight at hotel in Kathmandu, finish your Ganjala pass trekking.